The Serer religion, or a ƭat Roog ("the way of the Divine") is the original religious beliefs, practices and teachings of the Serer people of Senegal in western Africa. The Serer people believe in a universal Supreme deity called Roog (or Rog). Amongst the Cangin languages, Roog is referred to as Koox (var : Kooh), Kopé Tiatie Cac, Kokh Kox, etc. The Serer people are found throughout the Senegambia Region. Serer religious beliefs encompass ancient chants and poems, veneration of and offerings to deities as well as spirits (pangool), astronomy, initiation rites, medicine, cosmology and the history of the Serer people. The Serer people believe in a supreme deity called Roog (or Rog) and sometimes referred to as Roog Sene ("Roog The Immensity" or "The Merciful God"). Serer tradition deals with various dimensions of life, death, space and time, ancestral spirit communications and cosmology. There are also other lesser gods, goddesses and supernatural spirits or genie (pangool or nguus) such as the fangool Mendiss (or Mindis), a female protector of Fatick Region and the arm of the sea that bears her name; the god Tiurakh (var : Thiorak or Tulrakh) – god of wealth, and the god Takhar (var : Taahkarr) – god of justice or vengeance. Roog is the creator deity and is neither the devil nor a genie, but the lord of the creature. Kellog, Day Otis & Smith, William Robertson, The Encyclopædia Britannica: latest edition. A dictionary of arts, sciences and general literature, Volume 25, p64. Published by Werner, 1902. Niang, Mor Sadio, IFAN. Ethiopiques numéro 31 révue socialiste de culture négro-africaine 3e trimestre 1982 . Seck, A., Sow, I., & Niass, M., Senegal, [in] The biodiversity of traditional leafy vegetables, p. 85-110 . Bressers, Hans & Rosenbaum, Walter A., Achieving sustainable development: the challenge of governance across social scales, Greenwood Publishing Group, 2003, p 151, ISBN 0-275-97802-8. 18. ^ Thiaw, Issa Laye, "La femme Seereer" (Sénégal), [in] Fatou K. Camara, "Moving from Teaching African Cusmary Laws to Teaching African Indigenous Law"
^ Joshua Project: "What are their beliefs?" ^ (French) Prometra International, Prometra France, "Promotion de Medicine Traditionnelles"
"Fixed towards the sky or drawn on the ground. ^ Camara, Alhaji Sait, [in] "Sunu Chossan" formerly "Chossani Senegambia" (history of Senegambia). GRTS PRoograms. ^ It can mean either "heart" or "honour" depending on the context. At the surprised attacks of Naodorou, Kaymor and Ngaye, where the Serers were defeated, they killed themselves rather than be conquered by the Muslim forces. In these 19th-century Islamic Marabout wars, many of the Serers villagers committed matyrdom, including jumping to their deaths at the Well of Tahompa. In Serer religion, suicide is only permitted if it satisfies the Serer principle of Jom (also spelt "Joom" which literally means "honour" in the Serer language) - a code of beliefs and values that govern Serer lives. The Serers have also battled many prominent African Islamic jihadists over the centuries. Some of those like Maba Diakhou Bâ is considered a national hero and given a saint like status by Senegambian Muslims. He himself was killed in battle fighting against the Serer King of Sine - Maad a Sinig Kumba Ndoffene Famak Joof on 18 July 1867 at The Battle of Fandane-Thiouthioune commonly known as The Battle of Somb. While most Serers converted to Islam and Christianity (specifically Roman Catholic), their conversion was after colonization. They and the Jola people were the last to convert to these religions. Most of the Serer converts to Islam were through conversion by choice, not because of defeat in war i.e. Islamic jihadism. Many still follow the Serer religion especially in the ancient Kingdom of Sine. Senegal and the Gambia being predominantly Muslim countries, most Muslims see the Serers as stubborn for refusing to abandon their religion in favour of Islam. The peak of the Star (top point) represents the Supreme Deity (Roog). The other four points represent the cardinal points of the Universe. The crossing of the lines ("bottom left" and "top right" and "top left and bottom right") pinpoints the axis of the Universe, that all energies pass. The top point is "the point of departure and conclusion, the origin and the end". Among the Serers who cannot read or write the Latin alphabet, it is very common for them to sign official documents with the Star of Yoonir, as the Star also represents "good fortune and destiny". One of the most important cosmological stars of the Serer people is called Yoonir. The "Star of Yoonir" is part of the Serer cosmos. It is very important and sacred and just one of many religious symbols in Serer religion and cosmology. It is the brightest star in the night sky, Sirius. With an ancient heritage of farming, "Yoonir" is very important and sacred in Serer religion, because it announces the beginning of flooding and enables Serer farmers to start planting seeds. The Dogon people of Mali call it "Sigui", whilst in Serer it is called "Yoonir"  - represented in the form of the "Pangool" (interceders with Roog - the Supreme Deity) and "Man". It is before this event where the Serer High Priests and Priestesses known as Saltigue gather at the "Xoy" annual Divination Ceremony where they predict the course of the winter months among other things relevant to the lives of the Serer people. The Pangool (singular : Fangool) are ancestral spirits (also ancient Serer Saints in Serer religion) represented by snakes. Serer cosmogony. A representation of the universe. The tree worlds : the invisible world, the terrestrial world and the nocturnal world. 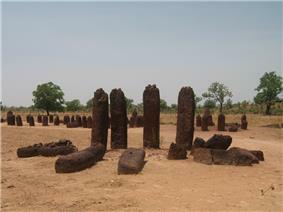 The cult of the Upright Stone, such as the Senegambian stone circles, which were probably built by predecessors of the Serer, were also a place of worship. 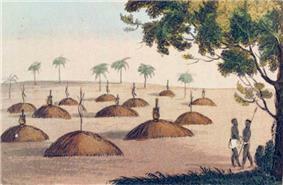 Laterite megaliths were carved planted and directed towards the sky. Yoonir, symbol of the Universe. As the old pagan festivals are borrowed and altered by Christianity which came later, the names of ancient Serer religious festivals were also borrowed by Senegambian Muslims in a different way to describe genuine Islamic festivals in their own language. The Serers are one of very few communities in Senegambia apart from the Jolas who actually have a name for god[s] which is not borrowed from Arabic but indigenous to their language. Tobaski (var : Tabaski) was an ancient Serer hunting festival; Gamo was an ancient Serer divination festival; Korite [from the Serer word kor] was a male initiation rite; Weri Kor was the season (or month) Serer males went through their initiation rites. Gamo (comes from the old Serer word Gamahou, variation : Gamohou). "Eid al kabir" or "eidul adha" (which are Arabic) are different from Serer Tobaski, but the Senegambian Muslims loaned Tobaski from Serer religion to describe "Eid al Kabir". Gamo also derives from Serer religion. The Arabic word for it is "Mawlid" or "Mawlid an-Nabi" (which celebrates the birth of Muhammad). Weri Kor (the month of fasting, "Ramadan" in Arabic) and Koriteh or Korité ("Aïd-el-fitr" in Arabic which celebrates the end of the month of fasting) also comes from the Serer language. Prediction ceremonies organized by the Saltige, who are considered to be the custodians of indigenous knowledge. Such meetings are aimed at providing information and warning people about what will happen in the village during the next rainy season. Preparation of sowings, a ceremony called Daqaar mboob aimed at ensuring good millet or groundnut production. For this purpose, every grower has to obtain something called Xos, further to a competitive ceremony consisting of hunting, racing, etc. The Serers also have an ancient knowledge of herbalism which is passed down and takes years to acquire. 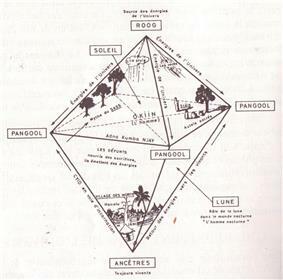 The Senegalese government has set a school and centre to preserve this ancient knowledge and teach it to the young. The CEMETRA (Centre Expérimental de Médecine Traditionnelle de Fatick) Membership alone consist of at least 550 professional Serer healers in the Serer region of Sine-Saloum. While Christians may wear a cross on their necks, the Serers use something belonging to their ancestor, such as the hair of an ancestor or an ancestor’s treasured belonging, which they turn into juju and wear either on their person or visibly on their necks. In the past, where someone kills another person, the victim’s family have the right to either forgive or seek vengeance. Again, the murderer and his family will gather at a local centre headed by the Chief or the palace headed by the King. Before this judgement, the murderer's family will cook some food (millet) to be shared among the community and the victim’s family. The victim’s family will nominate a strong man armed with a spear with a piece of cooked lamb or beef at the end of it. This assassin taking his instruction from the victim’s family will run towards the murderer who has now got his mouth open waiting for his judgement. If the assassin killed the murderer with his spear, then that is the end of it, the victim’s family have made their judgment. After that, the food that had been cooked would not be eaten and everyone would disperse. From that day on, the families are strangers to each other. If on the other hand the assassin ran and gently feed the murderer with the piece of meat sticking at his spear, then that signals that the victim’s family have forgiven the murderer. In that case, the community would enjoy the meal and the two families would be sealed as one and sometimes even marry off their children to each other. Were a young man and a woman found engaged in premarital relationships, both were exiled to avoid bringing shame to the family, even if pregnancy resulted from that courtship. Courting for a wife is permitted but with boundaries. Women are given respect and honour in Serer religion. The woman must not be dishonoured or engaged in a physical relationship until after she has been married. When a man desires a woman, the man provides the woman gifts as a mark of interest. If the woman and her family accept, this then becomes an implied contract that she should therefore not court or accept gifts from another man whose aim is to court her. In Serer religion, Monday is the day of rest. 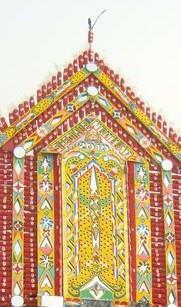 Cultural activities such as Njom or "Laamb" (Senegalese wrestling), weddings etc. are also prohibited on Thursday. The Raan festival of Tukar takes place in the old village of Tukar founded by Lamane Jegan Joof (or Lamane Djigan Diouf in French speaking Senegal) around the 11th century. It is headed by his descendants (the Lamanic lineage). The Raan occurs every year on the second Thursday after the appearance of the new moon in April. On the morning of Raan, the Lamane would prepare offerings of millet, sour milk and sugar. After sunrise, the Lamane makes a visit to the sacred pond – the shrine of Saint Luguuñ Joof who guided Lamane Jegan Joof after he migrated from Lambaye (north of Sine). The Lamane would make an offering to Saint Luguuñ and spends the early morning in ritual prayer and meditation. After that, he makes a tour of Tukar and perform ritual offerings of milk, millet and wine as well as small animals at key shrines, trees, and sacred locations. The people make their way to the compound of the chief Saltigue (the Serer high priests and priestess – who are the "hereditary rain priests selected from the Lamane's lineage for their oracular talent"). The symbol of the Ndut initiation rite. Both men and women can be initiated into the secret order of the Saltigue. In accordance with Serer religious doctrines, for one to become a Spiritual Elder (Saltigue), one must be initiated which is somewhat reserved for a small number of insiders, particularly in the mysteries of the universe and the unseen world. The Xoy (or Khoy) ceremony is a religious event and a special event in the Serer religious calendar. It is the time when the initiated Saltigue (Serer High Priests and Priestesses) comes together to literally predict the future in front of the community. These diviners and healers deliver sermons at the Xoy Ceremony which relates to the future weather, politics, economics, and so on. It is a very special event which brings together thousands of people to Holy Sine from all over the world. Ultra orthodox Serers and Serers who "syncretise" (converts to Islam or Christianity and who mix their newly found religion with the old Serer religion) as well as non-Serers such as the Lebou people (who are a distinct group but still revere the ancient religious practices of their Serer ancestors) among others gather at Sine for this ancient ceremony. Serers who live in the West sometimes spend months planning for the pilgrimage. The event goes on for several days where the Saltigue take centre stage and predict the future. The ceremony usually begins in the first week of June at Fatick. Each Serer family has a totem ("Taana"). Totems are prohibitions as well as guardians. They can be animals, plants etc. For example the totem of the Joof family is the antelope. Any brutality against this animal by the Joof family is prohibited. This respect gives the Joof family holy protection. The totem of the Njie family is the lion; the totem of the Sène family is the hare and for the Sarr family is the giraffe and the camel. There is no heaven or hell in the Serer religion. The immortality of the soul and reincarnation (ciiɗ in Serer) is a strongly held belief in Serer religion. The pangool are canonised as holy saints, and will be called upon and venerated, and have the power to intercede between the living and the divine. Acceptance by the ancestors who have long departed and the ability to intercede with the divine is as close to heaven after one passes over. Rejection by the ancestors and becoming a lost and wandering soul is as close to hell in Serer Religion. Whenever any member of the lamanic lineage dies, the whole Serer community celebrates in honour of the exemplary lives they had lived on earth in accordance with the teachings of the Serer religion. Serer prayers are addressed to the pangool who act as intercessors between the living world and the divine. In addressing their prayers to the pangool, the Serers chant ancient songs and offer sacrifices such as bull, sheep, goat, chicken or harvested crops. For the ordinary Serers, they addressed their prayers to the pangool (the Serer ancestral spirits and saints) as they are the intermediaries between the living world and the divine. An orthodox Serer must remain faithful to the ancestral spirits as the soul is sanctified as a result of the ancestors' intercession between the living world and the divine. The pangool have both a historical significance as well as a religious one. They are connected to the history of the Serer by virtue of the fact that, the pangool is associated with the founding of Serer villages and towns as a group of pangool would accompany village founders called "lamane" (or laman - who were their ancient kings) as they make their journey looking for land to exploit. Without them, the lamane exploits would not have been possible. In the religious sense, these ancient lamanes created shrines to these pangool, thereby becoming the priests and custodians of the shrine. As such, "they became the intermediaries among the land, the people and the pangool". In Serer, Roog Sene is the lifeblood to which the incorruptible and sanctified soul returns to eternal peace after they depart the living world. Roog Sene sees, knows and hears everything, but does not interfere in the day-to-day affairs of the living world. Instead, lesser gods and goddesses act as Roog's assistants in the physical world. Individuals have the free will to either live a good and spiritually fulfilled life in accordance with Serer religious doctrines or waver from such doctrines by living an unsanctified lifestyle in the physical world. Those who live their lives contrary to the teachings will be rightfully in the afterlife.